Organization! It’s a wonderful, if short-lived thing. I’ve been doing a lot of cleaning and organizing and getting-rid-of-stuff over this winter break. I culled something over seventy books from my overcrowded bookshelves, which means that the books I own now fit on my bookshelves without stacks on the floor for the first time since I moved back to NYC. (Some of them are still double-shelved, but shh, that totally doesn’t count.) 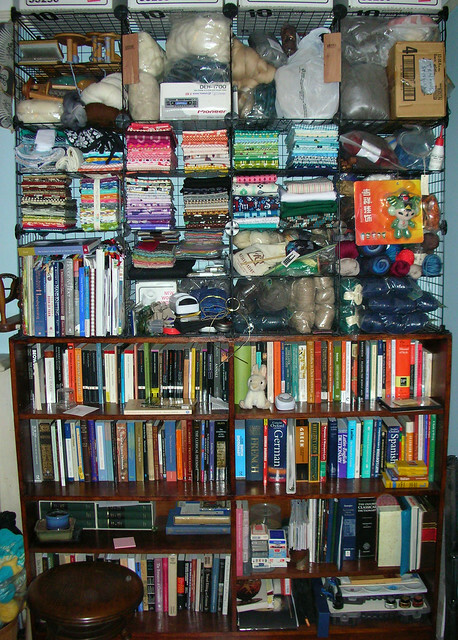 I left the bookshelf-bit in this photograph, which is theoretically all about the fabric stash in the top half. You can see all the books! I am irrationally happy about this. 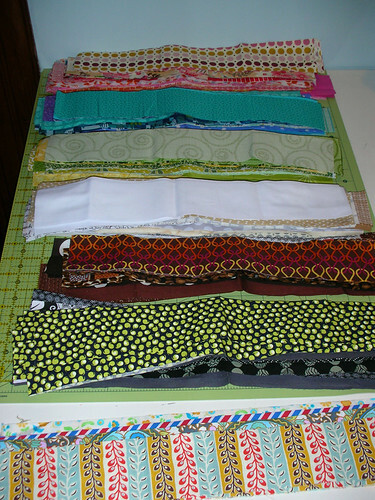 I also took the opportunity to re-organize my fabric, which is now organized by color, as well as by cut size (more than 3-yard cuts are all in one place), and my sewing cart, which has made getting to things a lot easier, as well as giving me a bigger box for scraps (which is amusing, since right now I’m at probably the lowest level of scraps I’ve been at in months, what with the Scrappy Trip quilt decimating my scraps. Even the contents of the fat quarter box are really organized! The pieces stuck in the left side are long quarters, so I don’t pull something and then get all disappointed when I realize that, no, I can’t cut a 17″x15″ piece from a long quarter-yard. But I also got some fabric in the mail, as belated Christmas presents. I didn’t photograph much of it, but I couldn’t help but get a picture of the Pearl Bracelets fat quarter set that I got from Stash Modern Fabric. Look, isn’t it pretty? All the colors! I love this print so much. 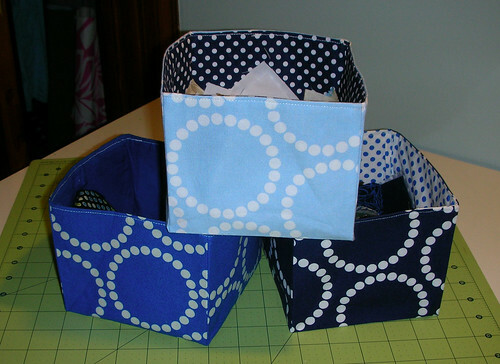 I couldn’t resist pulling some of it right away — cosmonaut, anchor, and river bend are the colors I chose — and I made these three fabric boxes using a tutorial on The Sometimes Crafter. I used an iron-on interfacing (Pellon 809, which is really stiff) instead of sewing in interfacing, and I think it’s working out pretty well. 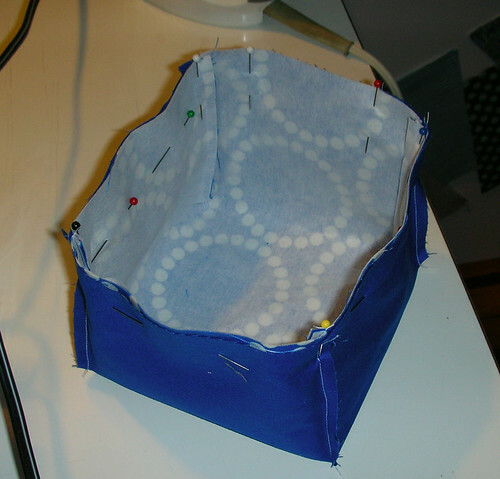 I pinned them carefully, with vertical pins at each corner, to hold things in place and horizontal pins for three sides, so I wouldn’t have to pull out the pins while I was sewing. I marked the turning hole with vertical pins, because I have been known to sew all the way around something and only then realize that I needed to leave part of it open to turn the project right-side-out. Ironing them square was really fun, though I didn’t take any pictures of that stage. There’s a good tutorial on The Sometimes Crafter. 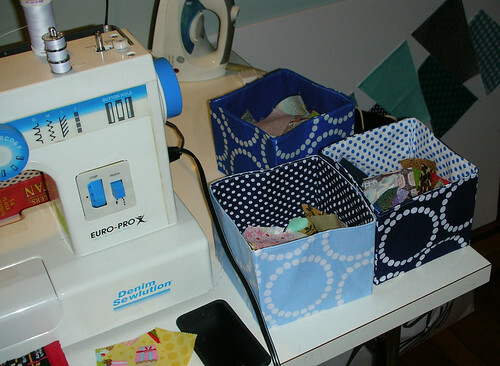 I’m using them to hold leaders and enders (light in the light box, dark in the dark, sewn pairs in the medium blue box), and I’ve already emptied the medium blue box once, because it was full of paired ones, and I needed more space! These are actually my first finish of the year, so I’ve added a picture of them to the 2013 Finish-A-Long Flickr pool. Author AlisaPosted on January 14, 2013 January 14, 2013 Categories Quilting, SewingTags 2013 finish-a-long, fabric stash, finished!, process, small sewn projects2 Comments on Organization! It’s a wonderful, if short-lived thing. I have enough projects half-done that I really ought not take on another one. But we all know how that works, right? The Scrappy Trip Around the World quilt has been flying around, and I’m afraid I caught the bug big-time. The idea for this pattern is basically to use up scraps — you cut strips 2 1/2″ x 16″ and put them together more or less at random. The pattern is really quite ingenious. I’ve really only just finished cutting, so I’ve only made a couple of strip sets so far: I’m going to do at least ten, and then pull out the iron and cut them into proper strips and make up squares. 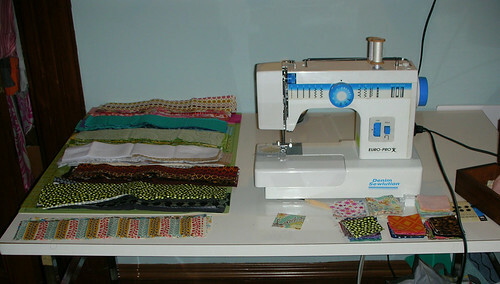 Compared to a lot of people out there, I haven’t been quilting for all that long. And I tend to cut fabric as carefully (obsessively?) 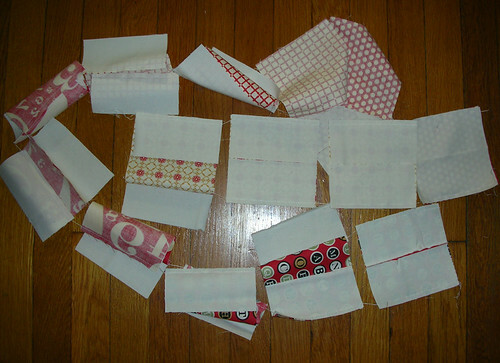 as I can, so I went through all my scraps pretty fast and didn’t have enough strips cut for the size quilt I wanted. So I went through my “mistake” fabrics — you know the ones, the fabrics that looked great on the shelf or in the picture online, that showed up and made you wonder what you were thinking. Then I went through my fat quarter box and pulled a ton of Jo-Ann fat quarters that I bought on sale a few years ago, to so “something” with. And then, with absolutely perfect timing, two scrap packs I bought before I was even thinking about this quilt arrived in the mail, so I cut those all up and added them to the count! 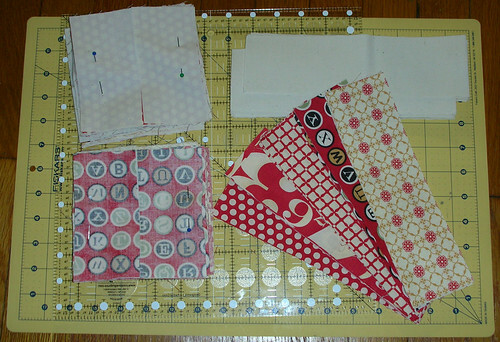 In the end, I cut kind of a lot of fabric. Why so many? 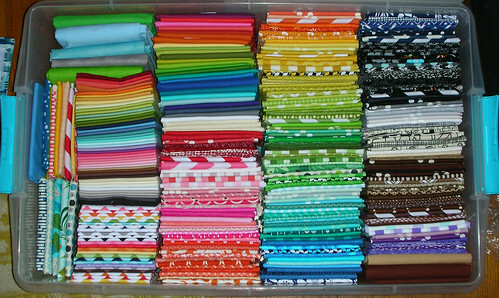 I could tell you that it’s because Brenda, of Pink Castle Fabrics did the math to tell how many strips to cut for various sizes of quilts, and you need 336 strips for a queen-sized quilt. I could tell you that! I’m certainly planning on a queen-sized quilt. But, um. I kind of just got caught up in the joy of hacking up scraps. I also tossed in every once in a while something that I really do like, so that I’ll be able to look at the quilt and find squares that I love hiding in all the scrappiness. Now, this quilt thrives on randomness, and I’m really bad at random. So I cheated. 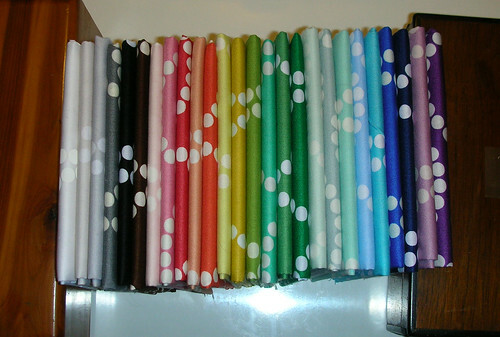 I divided up my fabrics into color groups. In case you’re wondering, I cut 74 Pink/Red/Orange, 74 Yellow/Green, 75 Blue/Purple, 38 Dark Browns, 40 Blacks, 71 Light Neutrals, and 20 OMGWTF ALL THE COLORS strips. With this pre-color-selected setup, it’s really easy: all I have to do is make sure that each block contains one black or brown, and something from each other pile. Or two from one pile, if I’m feeling in a blue and purple mood. It makes putting together the blocks really easy for me, which it would not be at all if I had to pull from a giant pile on the floor. I’m trying one new thing for this project: I’m using leaders and enders. 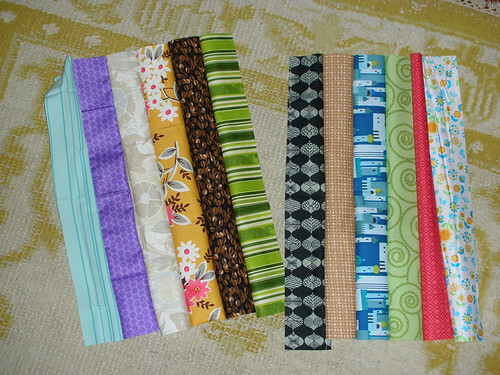 I’ve got more than enough 2 1/2″ squares, between my own scraps and some mini-charm-packs I picked up from FatQuarterShop. I’m using a shortcut for those, too: I’ve divided them into “light” and “dark” and made three piles of each. 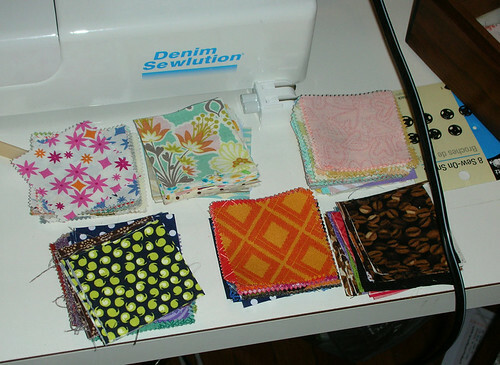 When I need to pick up another two squares, I match up whatever’s on top of those piles with whatever else is on top and looks best. So far, I’m getting quite a few of them, and it’s really satisfying. Not to mention, not having to hold down the thread ends every time I start a new strip? SO NICE. I’ve still got a few Christmas presents that haven’t made it up here yet, and a finished quilt to show off on Friday, if I can get decent pictures between now and then. I’m still working on the same sock, and it’s still a subway project! I’m using Happy Feet yarn on size 0 (2.0mm) needles. I’m about halfway done with the first sock, and well into the part of a sock that is the least interesting to me: the endless march down the foot. Unlike the cuff, you don’t have turning the heel to look forward to, and the toe isn’t interesting enough to make me excited about getting to it. Thankfully, the pattern for this sock is enough to keep me engaged. I altered it slightly to fit my larger-than-average feet. This pattern, Monkey, calls for you to cast on only 64 stitches: 4×16 = 4 pattern repeats. Well, I happen to know that my feet and ankles (not to mention my very high arches and deep heels) just don’t fit into a 64-stitch sock, unless I knit it with thicker yarn on larger needles. And we’re not talking about a “slightly bulky” sock, here — we’re talking about slippers. So I had to find a way to expand the sock to make it fit, without making it look really odd. I know that about 80 stitches makes a ribbed sock that fits me nicely, and that the Monkey pattern doesn’t have a huge amount of stretch to it: it’s knitted, so there’s some, and there are purl sections, which help, but it’s not super springy. I considered adding a fifth repeat of the Monkey pattern, to put me at exactly 80 stitches, but that would get awkward when it came time to do the heel and would be difficult to space out over the top of the sock when the time came for the foot: two and a half repeats? Three repeats? It didn’t seem like a great plan. So instead I cast on an extra ten stitches, and knit p2, k2, p2, k2, p2 ribbing between the first and fourth repeats of the pattern, along the back of the leg. If I had been thinking more clearly, I would have added fourteen stitches, because while this sock fits, it’s snug, and it’s a near thing: any smaller, and I wouldn’t exactly be eager to wear it. As it is, it fits, though getting it up over my heels can be a bit of an endeavor. In any case, it’s certainly better than my worst sock ever. In college, I went through a phase of knitting on VERY SMALL NEEDLES. 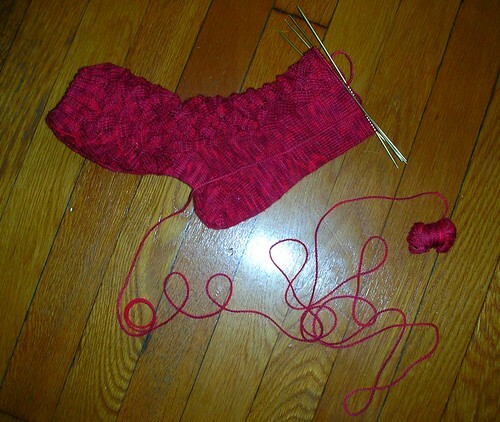 Let’s just say that if you knit a sock on 000 needles, with a normal sock yarn, and you pull the yarn as tight as I do? Well, I could wear it and have one very bullet-proof foot. It is SO uncomfortable, it lives in the back of a drawer and gets used to clean dust from my computer screen and that’s about it. What about your disasters? Any funny mistakes that you look back on now and laugh? This quilt is (hopefully) going to be a quick project. 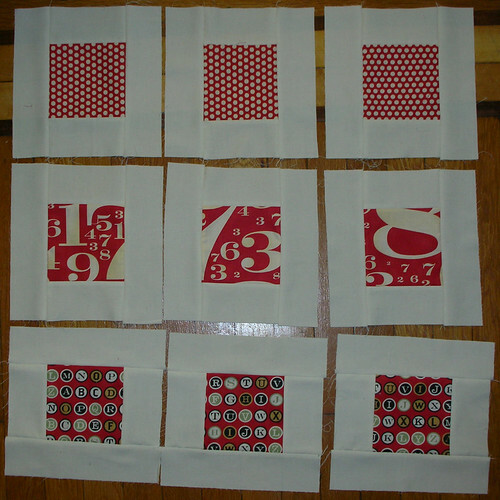 I’m following the tutorial for a Filmstrip Quilt at Crazy Mom Quilts. I’m not happy with the way the print repeats in the upper right hand corner, but I’m not sure how to fix it. Suggestions would be awesome. I’m using five fat quarters of the Circa 1934 and 1 yard of a Kona cream-colored cotton (I don’t recall which exactly), which were enough to make 15 block centers and 15 block borders, with a teeny bit of each print left over, which I may add to a scrappy binding, spaced out with black. I may also just bind it in a red-white-stripe. I cut my solid stupidly, and had to piece together my last two 9″x2.5″ strips together from scraps, which was a little annoying. I’ll know better next time. 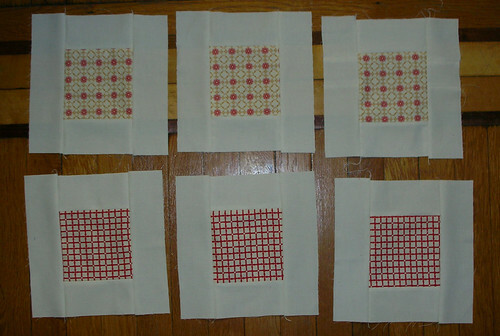 I finished all the white-bordered blocks first, before embarking on the red-bordered ones. Another two bouts of pinning and ironing and trimming later, I have all of my 30 blocks, trimmed to 8.5″. 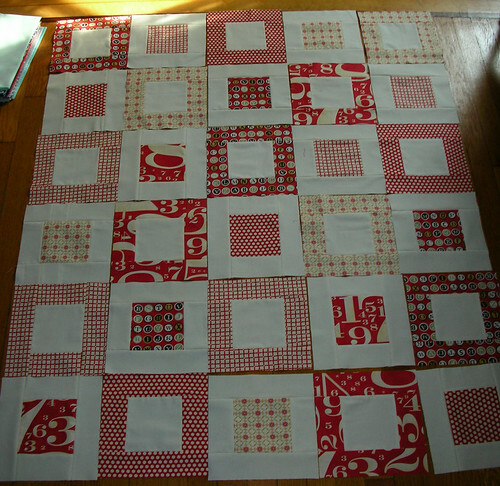 I haven’t the faintest idea what I’m going to do with this quilt once it’s done, but I can figure that out later. 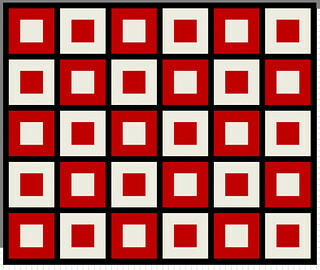 Author AlisaPosted on July 13, 2012 July 13, 2012 Categories QuiltingTags filmstrip quilt, process, quilt blocks4 Comments on Circa 1934 meets Filmstrip. Sewing on a Singer 66. 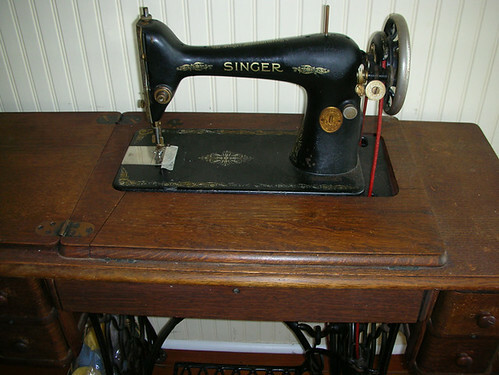 I mentioned last week that I’ve been sewing on a Singer 66 foot-treadle sewing machine, so I thought I’d post a little bit about the machine. 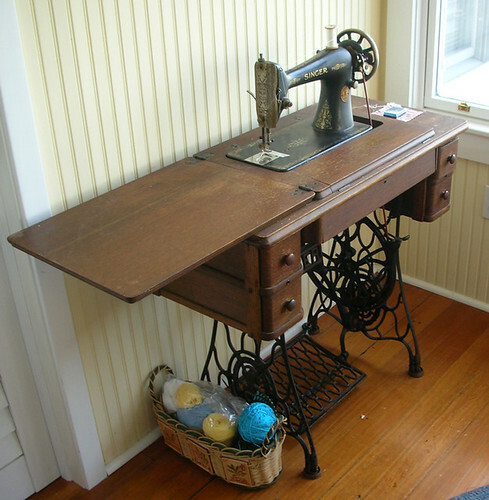 I learned to sew on this machine when I was around ten or twelve, and played with the foot treadle and base of the table before then: it made a great fort if you draped sheets around it and you were very, very small. 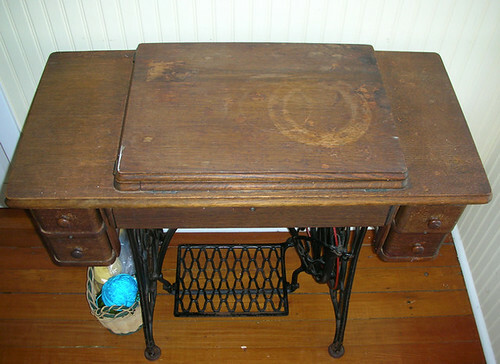 Then you flip open the tabletop, which folds up to the left, and you see that this little table holds something rather more interesting than a drawer! 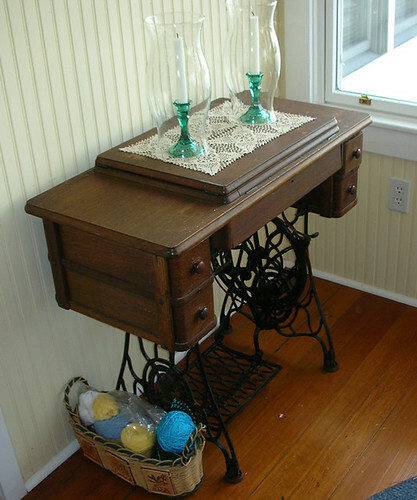 Other than, of course, the four drawers it has on its sides, which are fabulous for holding thread and pins and needles and scissors and all the other notions you want to put somewhere close at hand. This machine is really well designed. 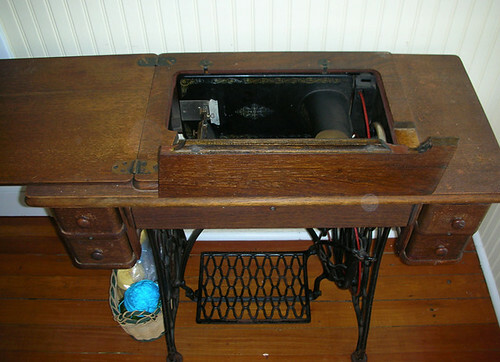 Then you look in: it’s a sewing machine! Lying on its side! You pull the machine up, and lift it just high enough that the front piece of wood goes beneath it: the machine rests on it, and stays up and solid. This is a really well-engineered machine, and it all fits together very well. Then you make sure the belt goes around the drive wheel, under the table, and check it’s seated properly around the machine’s wheel, and you’re almost ready to go. You can see the drive band in this picture: it’s the red thing that loops around the cast-iron wheel. 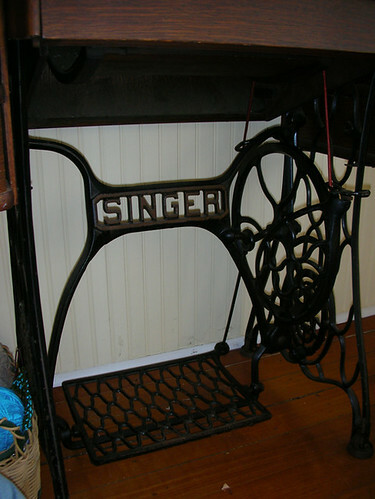 When you treadle, the large wheel (let’s call it the drive wheel) goes around: the belt connects it to a smaller wheel on the machine, and a series of little gears and belts powers the machine, making the needle go up and down as you treadle. The biggest difference for me in sewing on this machine, once I’d gotten it oiled properly and the tension adjusted (you turn the large knob on the head of the machine to adjust the top thread tension, and the bobbin thread just sort of does its own thing), is that you have to remember that your feet need to keep moving. Once it’s in the swing of things, this is easy enough: it’s trying to sew while the machine is still waking up (so to speak) that’s a chore. 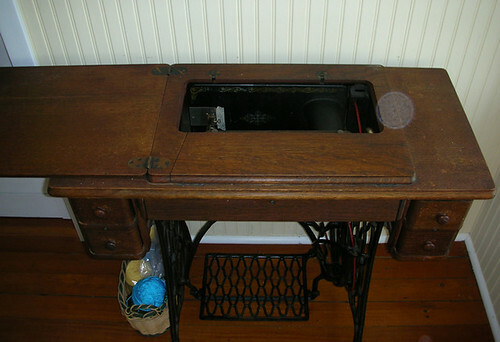 Sometimes I’d have to re-start the wheel by hand on each full rock of the treadle, because it stalled out, which was very annoying. 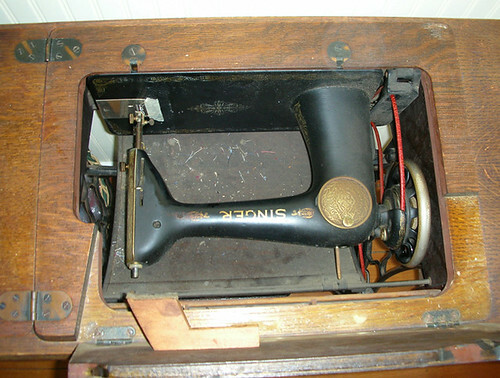 But I did learn to sew on this machine, so it came back to me — kind of like riding a bicycle, I suppose. It’s the same muscle-memory coming back to help you, after all. I still found that my seams are less precise (I don’t have a quarter-inch foot for this machine, for one thing, thus the masking tape) and that the fabric tends to drag more — I’m going to try buffing the bottom of the foot, to see if getting rid of some of the corrosion will help the fabric move more smoothly. Overall, though, it’s a fun project, and I’m really enjoying myself — I feel very lucky to get the chance to use this, and to also be able to go home and use an electric machine with a simple one-foot-pedal, which always seems so easy in comparison when I first get home! If there’s anything in particular you’d like to know about the machine, just ask — if I know the answer, I’ll answer to the best of my ability! 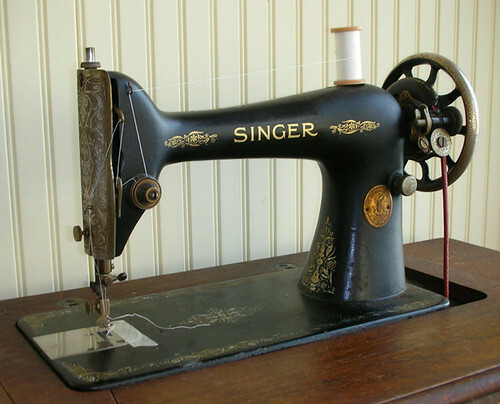 I’m not sure when this machine was made: there are a lot of websites about the history of sewing machines, and they mostly seem to suggest that the Singer 66 model was made for a long period of time. I don’t know how to localize it more specifically than that. Let’s end with a quick reminder about the Lets Get Acquainted Blog Hop on Plum and June. Today is the Monday link up! Head on over to find out who will be posting this week, and check out their blogs on Tuesday and Thursday — you’ll find some really excellent tutorials and quilters this way. 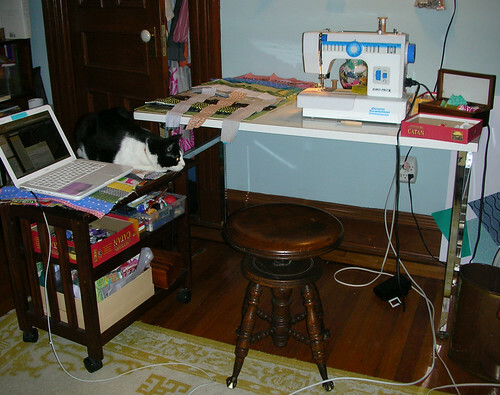 Author AlisaPosted on July 9, 2012 July 9, 2012 Categories QuiltingTags process, sewing on a singer 664 Comments on Sewing on a Singer 66.